After what seems like a year, we’re finally making progress with decorating the house. 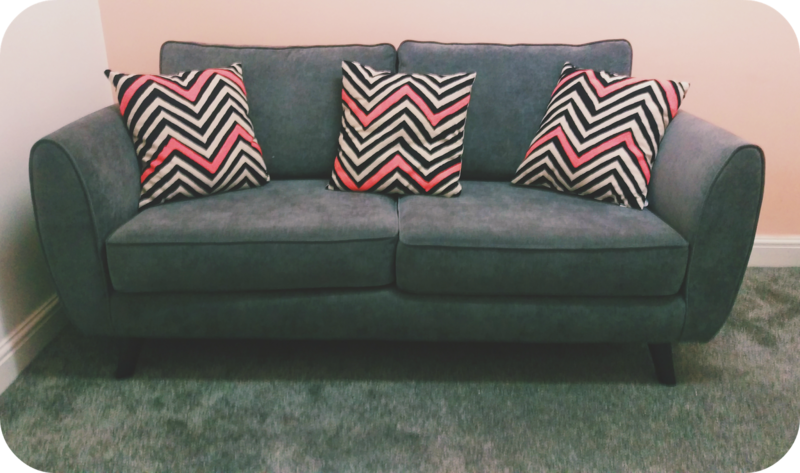 The sofa has arrived and I managed to get some funky cushions from Tiger, to tie it together with the look that I’m going for with the room. All I need now is a TV that works! My laptop really isn’t ideal to watch my favourite things on especially when I want to live tweet or shop at the same time. After hours of research and wondering around a few electrical stores, I have found my dream television. I’d really love to get a Viera 4K TV put up on to the wall so that I can kick back and enjoy trash TV until my heart is content! Yep that’s right, I did say trash TV. I am obsessed with some of the weirdest programmes on TV/Netflix and today I’m collaborating with Panasonic to let you in on my watching habits. I really hope by the end of it some of you will tell me that I’m not the only one that enjoys watching bad reality TV and terribly thought out game shows. 1. Real housewives of – Ok before I go any further I’m going to just say it again. I just love trash TV. It’s so frickin addictive and I love watching how the other half live. Human behaviour in general fascinates me and reality TV gives me access to that without being weird about it, you know? I mean I can’t be 100% sure but I’m fairly certain following people around to see what they get up to is frowned upon. “The Real Housewives Of” is full of all the things I love to hate. The fake tan, materialism and ALL OF the bitchiness and yet I just can’t stop watching! I’ve watched Orange County, New Jersey and now I’m on to Beverly Hills. Yeah…I think I might have a small problem here…. 2. Pretty Little Liars – For a long time I tried to resist and say no. No, I’m not a part of this craze but I caved and here I am, 6 seasons into it (still none the wiser, mind) and still unable to stop watching. I’ll be honest though, this season has bored me a little and I’m not as obsessed as I have been in the past but I still don’t see myself not watching it any more. The girls are all really likeable and I’ve been loyal for so long, so I have to see it through P.S. Alison totally is A, right? 3. Yeh Hai Mohabbatein – If past me was to read this, she would be cringing so hard. Something I never thought I would say is that I’m obsessed with an Indian soap. The story line is extremely far fetched and the whole thing is very very dramatic (way too complex to go into) but with all that stripped away, the basis of it is one husband’s love for his wife and that is what keeps me watching. It’s major cute! It also has subtitles so I’d actually recommend it to you all if you like unrealistic drama with strange storylines about love. 4. Love – That leads me on to the next program really nicely. I have got to give it to Netflix for pretty much all of their original series. They’re all so so good and ‘Love’ is no exception. It’s about a girl with issues and a dorky guy and their love story but that’s not why I’ve been hooked. I love that it’s so realistic. Just because she’s a conventional “bad girl” doesn’t mean she’s a bad person and just because he’s a nerdy guy doesn’t mean he’s good right? Seriously, watch it if you haven’t already and if you have or do end up finishing it please discuss it with me! I need to discuss my dislike for a certain character! 5. Happy Valley – I first heard about this intense Brit cop drama on my commute to work where two men were so deep in discussion about it, that I had to find out what they were talking about. I went home and started watching it the next day and I am hooked! It seems Netflix are loving it too because they’re going to be adding it to their website soon. Watch this space! 6. Bargain Hunt – This programme got me through my unemployed days and will always have a special place in my heart. The excitement that I feel when it’s on the telly is slightly odd but I have absolutely no shame in admitting that it is my dream to go on Bargain hunt. Everything from the god awful fleece jackets to the very odd presenter makes it a great watch. Please tell me I’m not the only one who loves this?